Yesterday’s steep stock market declines produced a very sharp spike in the number of stocks with a RSI below the 30 level, which has usually been a sign that a price floor is near. The percentages of S&P 500 stocks with their 5, 10 and 14-day RSI below 30 are 69%, 48% and 28%, in that order. These percentages are well above their 2-year averages of 16%, 7%, and 4%, respectively. This is a sign of indiscriminate selling and subsequent rallies, however, the market usually does not have a big rally until these percentages drop to more normal levels, indicating that the RSI for many stocks is just beginning to rise above 30, which is the classic buy signal for this indicator on an individual stock basis. 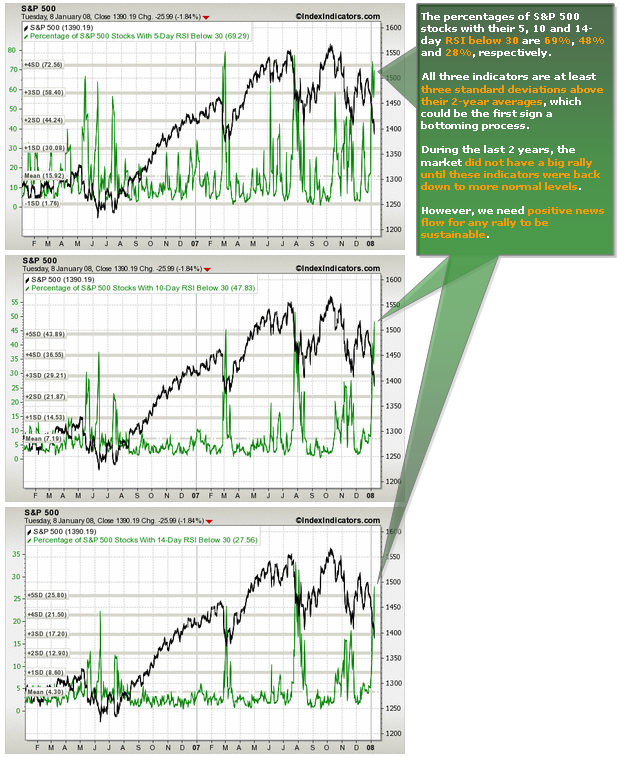 Over the past two years, the market declined sharply for at least one more time producing smaller spikes in these RSI-based breadth indicators before rallying in a more sustainable fashion, but this needs to be supported by positive news flow.